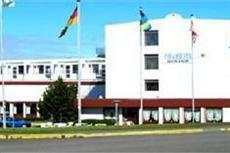 Located in the heart of Husavik, the Fosshotel is only a walking distance from the harbour. The hotel offers 70 comfortable rooms equipped with a host of modern amenities to ensure you a relaxing stay. Specially adapted rooms for the physically challenged guests are also available. You can dine in elegance at the onsite restaurant that serves a variety of delicacies. The bar is an ideal place to enjoy your favourite drink in a relaxing atmosphere.